Manco 5959 Kevlar go kart belt. Pix Asymetra 5959. Home > CVTech - ASW CVT Drive Belts > MANCO 5959 ASYM BELT. IMPORTED KEVLAR GO KART BELT 5959. Manco 5959 Kevlar Go kart belt. ASW 5959. Manco 5959 (ASW/American Sportworks) Go Kart belt. 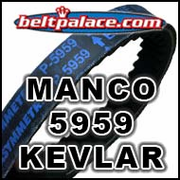 PIX-NA Asymmetra 5959 belt for Manco Go-Karts. Imported. No warranty. 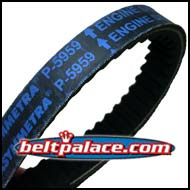 Replaces: Stens 255-299 COMET 203589 A/DF MANCO 5959 belt, Carter Brothers 5959 drive belt. Kenbar 300-009 belt. COMET 994-70 Belt for 30 Series Karts FREDERICK/OREGON 84-027 belt. PRIME LINE 7-07895 belt. Murray 8487 belt. Rotary 12-8487 (128487 belt), SUNBELT AC-589. Baja Blaster belt BB65-395, BELT DRIVE (Qinjiang #669-ASYM). See Comet 217248A Belt for Exact Size Superior Quality Belt. COMET 217248 (A-DF), EXACT OEM REPLACEMENT FOR ASW/MANCO 5959 Go Kart Belt for Comet 30 Series. Heavy Duty Kevlar.